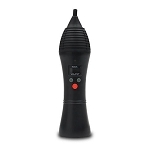 The Airis Herbva Pro is an advanced portable device for dry that combines a high grade ceramic oven, isolated airway path and convenient touch screen temperature controls for an amazing on the go experience. 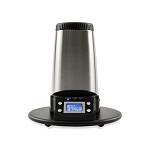 The unique ceramic oven is located on the base of the vaporizer with a easy-access silicone plug that streamlines the refill process. The airway between the chamber and mouthpiece runs the entire length of the device while completely avoiding all the electronic components, this allows your vapor to cool as much as possible while also maintaining that natural flavor quality. 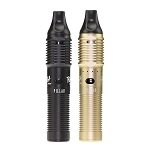 It has a wide and versatile temperature range that will help you achieve just the results you are after in terms of flavor or vapor quality. Just press the power button 3 times to begin a heat cycle, then use the Touch activated + / - keys to adjust your temperature settings anywhere from 300-435°F. A light press will adjust in one degree increments and a long press/hold will quickly speed through the various output options. After you've found your ideal temperature level the Herbva Pro will reach it in just 15 seconds. There is an LED light indicator above the display screen that flashes green while it is ramping up and will remain a solid green after you've hit your desired setting. It will heat for a solid 5 continuous minutes before powering off, during this time you can press the power button one more time to lock the OLED display screen and keep your exact settings in place throughout the cycle. Inside there is a powerful lithium-polymer battery with massive 2200mAh capacity that will keep you going for quite some time on a full charge. At any time you can view your remaining battery life on the bright OLED display screen and when the time to recharge comes it will let you know via the LED light indicator flashing red 10 times. Just connect to the included USB charger and you will have a full charge in just 3-4 hours. 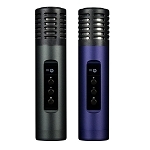 Measuring in at about 5 inches long by just over an inch wide, the Herbva Pro comfortable and discreetly fits into a pants pocket or purse for easy travel. Airistech even includes a black drawstring carry case with room for all of your cleaning/packing tool accessories to make things that much easier. Grab yours today and enjoy your favorite dry blends anywhere and anytime with the utmost convenience.